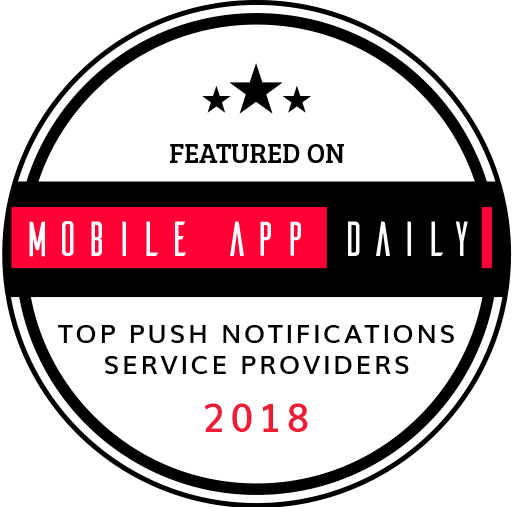 Kumulos has just been named a Top Push Notifications Service by MobileAppDaily. We think we’re allowed to be pretty excited as this comes off the back of last month’s recognition in the Top Push Notifications Services from The Tool and Business of Apps – for the second consecutive year! MobileAppDaily conducted an immense amount of research before shortlisting the Top Push Notifications Service Providers of 2018 which lists the best in the mobile marketing industry! Mobile app developers can increase user engagement with intelligent, location based, targeted push notifications so they are a vital mobile marketing tool. With Kumulos, app developers can deliver a push notifications service for clients or give them control with an easy-to-use, branded, mobile marketing automation portal. In recent months, we’ve added lots of new features too so our mobile app development partners can deliver better outcomes for their clients and their mobile apps. Some of the additions include channels, segments, beacons, geofencing, automation and updated custom analytics. If you’ve not tried Kumulos yet and want to find out how thousands of mobile app developers use Kumulos to deliver better outcomes for their clients, then sign up for a Free 30 Day Trial, or contact us, and we will be happy to give you a demo and show you what all the fuss is about!